Axl Rose performed the AC/DC classic “Highway To Hell” with Billy Joel during the singer’s May 13 date at Dodger Stadium in Los Angeles, and fan-filmed video from the event has surfaced online. Joel welcomed the Guns N’ Roses leader to the stage late in his main set for the 1979 track, which Rose delivered regularly while on tour last year with AC/DC in the absence of long time frontman Brian Johnson. The rocker wasn’t the only guest on Saturday: Pink appeared to perform "New York State Of Mind" with the singer before delivering her own hit, "Try." Rose made global headlines last year when he joined AC/DC for shows in Europe and the US after Johnson was sidelined from touring on the advice of doctors due to hearing loss issues. AC/DC’s future remains unknown following the 2016 trek, with cofounder and lead guitarist Angus Young the lone remaining original member after a number of changes in recent years, including the 2014 retirement of founder Malcolm Young due to dementia, a series of legal issues faced by drummer Phil Rudd, the spring 2016 departure of Johnson, and bassist Cliff Williams’ retirement. Rose has hinted about doing more work with AC/DC moving forward while the status of his and Johnson’s involvement with the group remains unknown. 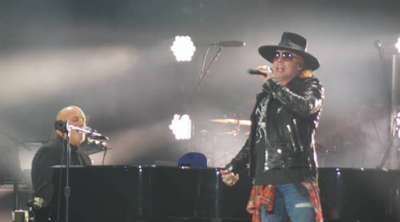 Young recently joined Guns N’ Roses for guest appearances at three shows on the Australian leg of their Not In This Lifetime tour. Rose and company will resume the trek in Dublin, Ireland on May 27, with another round of North American shows set to begin in St. Louis, MO on July 27.